My first Grove Park entry. Absolutely the best in show! We visited the Grove Park Inn last weekend and in our opinion, your entry was far and away the best in the contest. In fact we preferred the entries that failed to win anything to those that did. It makes us wonder: Are politics involved in the selection process? We have been visiting the show for many years now and, Susan, yours is the best we have ever seen! The detail was so remarkable. 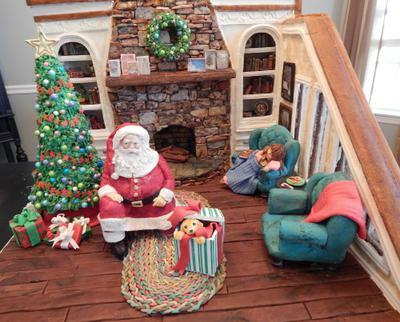 From the books on the shelves, pictures on the wall, leaded glass windows, braided rug, Christmas cards on the mantle, decorative plaster cornices, wallpaper,cookies and candy cane, stacked stone fireplace, the adorable child sleeping in the chair,... I could go on and on. How many hours did this take you to complete? We hope you will compete again next year. Thank you for making our visit more enjoyable. This was our favorite at Grove Park and yet we were surprised it didn't even place. Did any of the judges talk with you?